Why should I choose your shop? Do you have a customer shuttle service? How do your prices compare to others? How can I expect to be treated by your staff? Take a look at our special pricing regularly for weekly deals. See why our customers keep coming back for more! Good information on maintaining your vehicle. Napa Auto Care EasyPay Financing is available for your car's repairs at Raul's Auto Repair. - 6-months no interest if paid in full on purchases of $199 or more! - 6-month and 12-month financing at participating locations. My family has been going to Raul's since 2009 and still do. Raul and his Kevin do a great job of explaining the critical things that need work on and do so in an affordable manner. I recommend them highly for any used car repair and maintenance. ©Copyright 2007-2014 Raul's Auto Repair. 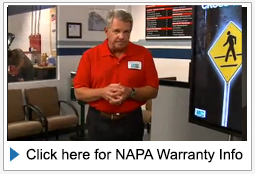 Raul's Auto Repair is an esteemed NAPA Auto Care facility located now in two locations to serve you better. Raul's Auto Repair is an Azusa, and Covina Auto Repair Shop with top-notch Automotive Mechanics and great customer service. The company serves the communities of Azusa, Glendora, Covina, West Covina, San Dimas, Baldwin Park, Irwindale, LaVerne and Monrovia. We offer auto repair and maintenance services ranging from simple oil changes, to smog inspections, to brake jobs, to automatic transmissions, to engine replacements and everything in between.